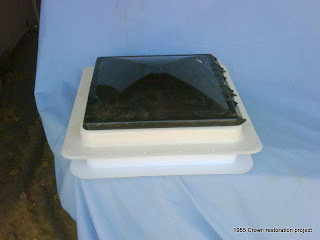 When we got the Crown home we were surprised that all of the screens were all missing, we think it was because they had to be taken out of the trailer and taken apart . Well this week end I took two windows out, the one at the kitchen at the left side and the one in the front, the first one I had a few problems adding the screen but I guess in the grand scheme of things, it is usable and will work for us a while, may go back in once we have gotten some use out of it, got it put back onto the trailer without any problems what so ever. 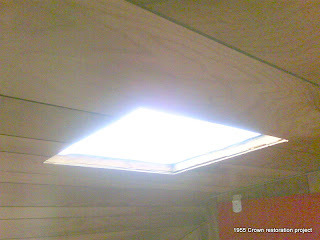 The front one was more difficult removing , it has a lot of water damaged wood in the frame work, and the skin had to be removed, that screen went on much easier and I was very happy with the results, I will have to replace some of the framework before reinstalling the window next week end if I have no problem replacing the frame wood that had water rot. It was hot and I forgot to take some photos but I will be sure to take some before I do any work next week end. Well over the last 2 week ends, I have sanded down and repainted all of the cabinets and drawers, Being the trailer was already painted Red and White and my wife collected Coke Cola and Campbell's soup items she decided to begin to decorate the Crown with Campbell's soup memorabilia. As you can see we painted everything to match the stove and ice box, Apple Red and White, I have completed approx 90% of the cabinets, I should complete it by next Sunday. Yesterday we drove to Oceanside to look for a camping location that we saw a few times taking the train there, the first one we found was not one we could get entry to being it was on the Marine Base, the next one was San Onofre, so we think this may have been the correct location, so we have another camping location we are now considing putting on our list of desirable locations, we seem to enjoy the Oceanside area, being we always end up returning there every year. Today, Sunday I reinstalled the front window after replacing the two side boards that had wood rot. We are now left with the rear window that we still need to do. The window must come completely out and taken apart due to the window arms [levers] that is used to open the window, it went back in OK, not as easy as the side one, but the result ended up being much better overall. I also installed a 110 power inlet being the one that was already there was not very safe, I connected it to the existing connections, We plan on adding a few more power plugs in the trailer being right now we have only two just below the light in the same assembly. 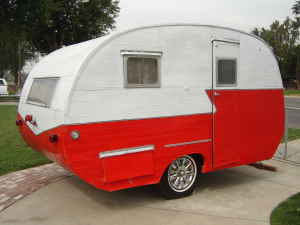 Next Week end labor day we will be taking the Teardrop trailer for 3 days to Lake Skinner. Well over this week end, I installed the new cushions, and added a interior door handle to help close the warped door, I also added a cable outlet on the outside and inside to allow us connection if and when a trailer camp offers cable TV. I am alarmed about how bad the tiles on the floor looked after a few hours of working, so I went ahead and mopped and waxed it again just to buff it out again next week, I think it will end up being very difficult to maintain this floor, so we hope that once the work is complete the floor will hold up much better and need less maintenance. I use the tile that is normally used in schools thinking it would wear and maintain better, last week end I framed the windows with an added section of paneling to cover up the area that had water damage. I also reduced the size of the futon mattress because it was overhanging the area where the bed goes, so it will allow my wife an easier time when we makes it. 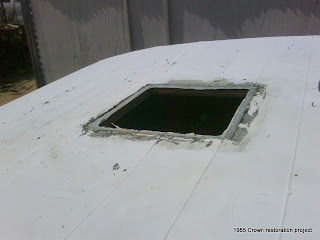 We are planing a maiden voyage, in May attending the Pismo Beach Vintage Trailer Rally on May 15--17th so I still need to complete replacing the ceiling vent, re-screening the rear window and adding a new brow over the window, and hopefully it will also allow me the time to do some additional roof repair, it does not now leak but I would not want to risk it. My wife still needs to make curtains and I need to hang them before May also. My wife made some great curtains for the kitchen and dining room, and we finally got the bed set up after I framed the windows and added new board to support the bed. 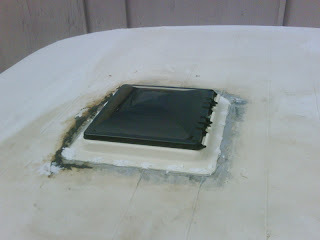 Today I was able to install the new roof vent, but due to the cooler weather I was unable to install the roof sealant, so I ended up adding silicone over each screw, and I had to cover the trailer with a tarp to protect it from possible rain. Next week end pending weather I will finish sealing the roof, I have also tried to fill in the paint over the rear window to install the new custom decal, the rolling of the roof sealant created a rough surface and to be able to install the decal I will need a slick surface. 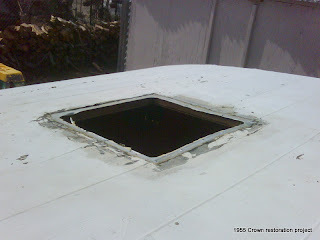 Well today I ended up starting the final major thing that I had to do with the Crown, removal of the old non working roof vent and plan to install a new one tomorrow. 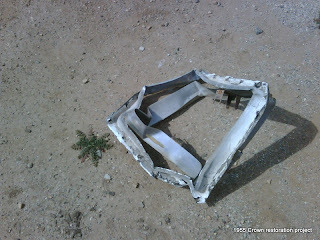 It was a real problem removing the old one, being the previous owner put layers of sealant over it and added many screws that I was unable to locate until I tried to remove it, it came out in a banged up disfigured lump of metal. I made sure there would be a clean surface to install it I use my power angle grinder wire wheel, and it was very difficult because I was unable to put much weight on the top of the trailer I had to position my body so my weight over a larger area, so it would not dent in, but at least I have it ready to move forward on Sunday. 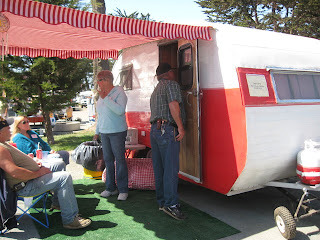 Last week end we were part of the 2nd annual Pismo Beach Travel Trailer Rally. There are a few photos of our camp and one of my beautiful wife Carolyn. With the video there is part one and two so follow the link, hopefully they will add part three some day, we are only in part three.